I first met Simon Chapman over 25 years ago Carp fishing in the south coast of England. Even in my youth, it was obvious to me he was a thinking, methodical and patient angler respected by all of the local angling community for his fishing accolades. I was thrilled, after our lives had taken us so far apart, when he got back in touch. Simon, now living in Canada, had a gap in his work schedule and had picked up a copy of my cowritten book as he was planning a trip to the Yucatan. He recognized my name, picked up the phone and we were planning his trip immediately. Simon’s trip coincided with one time client now friend for life Ryan from Colorado. We met the evening of Simons arrival which coincided with me buying a large Cobia from a local spear fisherman. Over the ensuing banquet we hatched a plan to fish that next morning on a lake I hadn’t launched in for 15 years. I knew the put in would be bad, far worse than I could take most clients, but I also knew these guys were the ones to do it with me. How Nick gets it done. It was far worse than I feared. It took 3 trips each. Mud to the knees, a Mangrove tunnel the prefect height to hurt anyones back and hungry Mosquitos intent on getting inside your ears. Finally we launched just after dawn. We all drank a beer. I motored until i saw a shoreline that was more pole worthy. Only one cruising fish in 200 yards and I wanted more. We were in the wrong place. I knew they would be there in numbers and didn’t want to waste the early morning advantage. We motored to the southern end of the lagoon. We quickly spotted fish rolling off the shorelines in open water and poled out to investigate. The light was still too flat to spot beyond 20 feet from the Jon boat. We poled passed them and turned our back on the rising sun and were quickly rewarded by a rolling fish coming at us at forty feet. He was visible. Simon led the fish, an immediate and aggressive response, a visual grab and after an explosive fight the first fish came to the boat. Ryan took over and raised many small fish to a gurgler until it was flushed into a bigger mouth and Ryan brought a cookie cutter 20lb fish to the boat. Having located the cenote (cave entrance) we found it to be alive with fish. The guys went on to land two more nice fish each though the real story was when a huge push of water came up behind Simons fly, was engulfed by a fish in the 60 to 70lb range that jumped, blitzed twenty yards, jumped again and spat our Clouser Minnow high in the air. This was the key moment. That fish threw down a gauntlet Simon’s way and he was going to pick it up. He said nothing at the time apart from sharing the obvious jubilation of having such a close up, visual fishing encounter with a fly rod, but it turns out he was already planning a return. Both Simon and Ryan went on to land more fish that day amongst the birds and Crocodiles who were as surprised to see us as we were delighted to see them after a 15 year rest. Simon fished Chetumal Bay and the Mahahual coast catching Jacks, Snappers and many, many Bonefish for the next few days. He had time to plan and the lake had time to rest, it worked both ways. Simon was staying in my guest house next door and, as he often does, after fishing he came round for a chat. He told me what was on his brain. He had unfinished business in that lake. I should have seen it coming. He had a score to settle and knowing that I was working (and unwilling to go through that launch again) he asked to rent a paddle board and go back solo. With two other boards out, I set him up with everything except an anchor. I said “it doesn’t take much to stop a paddle board so take this spool of 50lb line and find yourself a rock”. He was happy with that. We both thought it would work. I heard Simon leave at around 4.30 in the morning. I didnt see Simon until 6pm. He had a smile on his face and beer in his hand. The story began well. 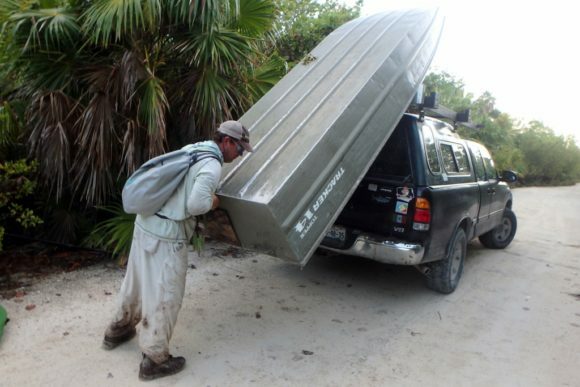 He carried all the gear on his own in just one trip down the muddy Mangrove tunnel. He fished around, caught a couple of fish and ended up back at the cenote where the one that got away was last seen. He hooks a fish of similar size and as he clamps down to set and begin the battle the 50lb anchor line gives. He’s not free floating though, he’s being dragged. Ive been there to help many people in my boat with fish that size but really don’t know how it must be on a personal watercraft with nobody to help to stop or position the boat and above all without an anchor. After a great fight recorded on Simons GoPro video he gets it board side and they part company on good terms. He had done it. The battle won, the score settled he is now free to move on feeling triumphant. 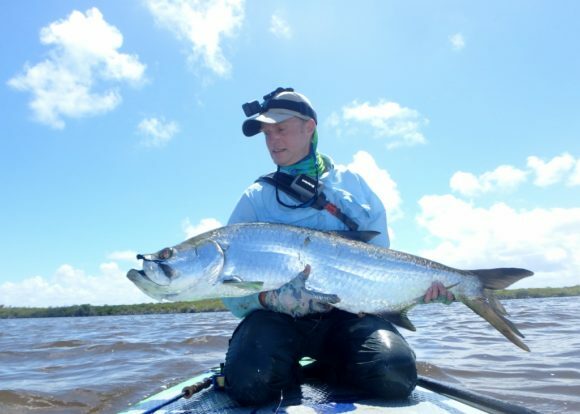 A really big fish to catch from an SUP, another memorable accolade well deserved. Simon is now at the down wind end of the lake time 11.30. After a long upwind paddle it was 1.30pm when Simon approached the take out. Happy with his achievements but exhausted nevertheless after the paddle. Feet from the gap in the trees he needs to go through, a Tarpon comes cruising casually yet purposefully through the gin clear, 2 feet deep water along the tree line. Whats an angler supposed to do? He swaps the paddle for his rod. Casts, feeds the fish at close range and is attached once more to another good sized fish. Once more he is at the mercy of the fish on his personal lightweight and anchor-less watercraft. In moments the fish runs into open water and Simon and his SUP are back in the wind in water too deep to wade to try to put any sort of meaningful brake on the fishes numerous charges and runs. He’s back to the wind, sailing and being dragged so its not too long until he finds himself all the way back to the bottom end of the lake again. Every yard he paddled hard for on the way back up was stripped from him in seconds on the return. It wasn’t until the water shallowed again at the down wind end of the lake until he was able to take more control. The fish came onboard for a couple of quick selfies and was measured at 44” to the fork before it kicked back off into its domain. 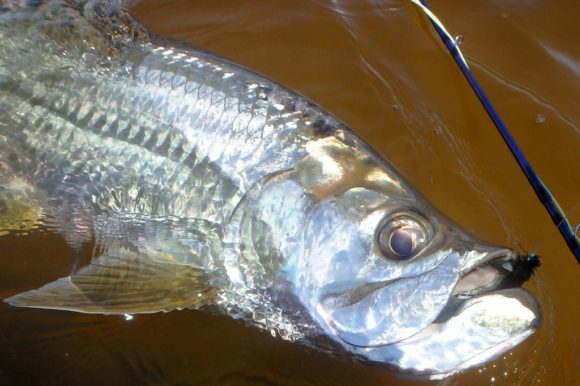 The tarpon that pulled Simon allllll the way back down the lagoon. Simon, almost out of water in the cooler, now had to make the paddle back up wind to the take out. I am sure the adrenaline from the fishing had worn off before he was even half way back. He arrived to the exit exhausted at 3.30pm. This time it was not guarded by a Tarpon but a Crocodile which he needed to persuade to leave before he could drag himself and the kit back out. 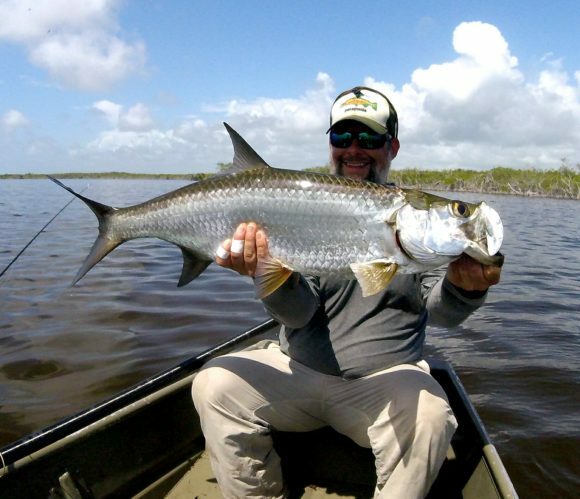 Question is… if he had seen a Tarpon instead of a Crocodile, would he have cast? Thanks for the story Nick. Going to have to get back down there!